An SMS-Based e-Government Model: What Public Services can be Delivered through SMS? Delivering public services through SMS (SMS-based e-government) is becoming popular in developed and developing countries as a strategy to engage more citizens in using e-government services. Current advances in SMS-based e-government applications by local authorities in developed and developing countries are investigated to determine what extent SMS-based e-government could deliver existing Internet-based e-government services and whether these services can fulfil the actual needs of e-government services users. The currently available SMS-based e-government services are presented as a model with six levels: Listen, Notification, Pull-based Information, Communication, Transaction, and Integration levels. The model classifies the SMS-based e-government services into levels based on the direction of communication, the complexity of the services and the benefits received by citizens; the higher the level the more complex the services and the more benefits received by citizens. The SMS-based e-government model is compared to Internet-based e-government models and typical e-government use to show SMS-based e-government can deliver almost all of the service offerings of Internet-based e-government and meet the requirements of e-government users except for downloading forms. The outcome justifies the development of SMS-based e-government services. Despite the high number of e-government initiatives in the world, one of the current critical issues in e-government is its low adoption rate particularly in developing countries. Research by Dalziel (2004) across 31 countries found that the use of e-government in developing countries is still low: just 14% compared to developed countries where the use is 40% on average. It is a critical issue since one of the main goals of e-government is to improve citizen access to government information and services as well as to ensure citizen participation in and satisfaction with government processes (E-Government Act of 2002). An e-government system is useful to the extent to which citizens actually use the services (Accenture, 2003). Until the gap between what is offered and what is used can be bridged, e-government is far from reaching its maximum potential and government can not justify large investments in e-government and get all of the value possible out of these investments (Al-Adawi, Yousafzai et al., 2005). In developing countries, Susanto and Goodwin (2006) argue that SMS-based e-government is more likely to increase e-government usage than the current Internet-based e-government. SMS-based e-government may be defined as a strategy and its implementation involves the utilization of Short Message Service (SMS) technology, services and applications for improving benefits to the parties involved in e-government including citizens, business, and government institutions. It may address the existing design-reality gap between the commonly proposed channel (the Internet) and the real ICT situation in developing countries which is high Internet illiteracy, lack of Internet infrastructure, high Internet cost, and low affordability (Susanto & Goodwin, 2006; Basu & Norris in Dada 2006). In developing countries people are more familiar with SMS than the Internet, the number of SMS users is much higher, the SMS infrastructure is more extensive, SMS costs are lower than Internet costs and mobile phones are much more affordable than PCs. For these reasons SMS could be the more appropriate channel to deliver e-government services in developing countries (Susanto & Goodwin, 2006). An empirical experiment in the Philippines showed that people prefer to contact their government using the SMS-based channel (87%) rather than the Internet (11%) (Lallana, 2004, p.30). According to technology acceptance theories, the cheaper service/technology might have a higher speed in adoption (Innovations Diffusion Theory by Rogers 1995), and the facilitation conditions (the available resources and knowledge) have a direct influence on the usage (Unified Theory of Acceptance and Use of Technology by Venkatesh et al 2003). 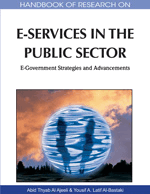 Since e-government services are for every citizen, a leading-edge technology should not be adopted unless most citizens are ready to use it (Lee & Hong, 2002), governments should provide services via the channels people have the technology and skills to access (Dalziel, 2004). Additionally, SMS-based e-government has proven benefits. Providing public services through the SMS channel significantly reduces time and cost; introduces a cheaper, easier and faster information-accessing channel; improves transparency, accountability, communication, and the relationship between government and citizens; makes the services and procedures easier for the citizens to use; improves the political image of the district, engages more people and increases citizens participation, and promotes e-Democracy (Lallana, 2004; Rannu & Semevsky, 2005; Bremer & Prado, 2006). As a result, SMS-based e-government is becoming popular in developed and developing countries. For example, by 2008 50 government organizations in the Philippines had provided SMS-based channel for public services. Since 2006, by sending an SMS message to a single number, Singapore’s citizens have been able to access 150 public services. In Indonesia most local authorities and majors have provided SMS services for listening to their people. In Australia, SMS has been used as a communications channel for bushfire alerts in Victoria and notification of public transport time-tables in Adelaide. As of January 2009, there have been 700 reports of SMS applications for public services in European countries (eGovernment Research Center 2009, Plans Review and Monitoring Office 2008).